Mothers who eat foods rich in vitamin B3 and essential amino acids reduce the risk of their children developing eczema. 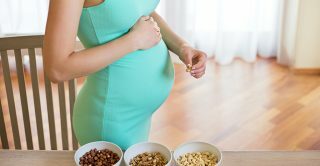 Researchers from the University of Southampton and University of Oxford found that consuming fish, meat, mushrooms, and nuts during pregnancy can help to improve the condition of children’s skin. These foods help women maintain high levels of nicotinamide, an essential nutrient, and tryptophan, an essential amino-acid. The researchers analysed data on almost 500 mother and child pairs taking part in the Southampton Women’s Survey. Those mothers with high concentrations of nicotinamide and tryptophan during pregnancy were less likely to have one-year-olds with eczema. Interestingly, the researchers found no benefit for children’s skin at 6 months. Information on mothers’ diets, lifestyle and socio-economic status was collected during their pregnancies. This was then compared to test results measuring whether children had eczema at 6 months and one year. Almost 11 per cent of children had eczema at 6 months, and nearly 14 per cent had the condition at one year. After taking all background factors into account, mothers who had higher BMI during pregnancy were more likely to have children with eczema at 12 months. Boys also had higher odds of developing eczema than girls at one year. Higher maternal serum concentrations of nicotinamide and related metabolites in late pregnancy are associated with a lower risk of offspring atopic eczema at age 12 months by S. El-Heis, S. R. Crozier, S. M. Robinson, N. C. Harvey, C. Cooper, H. M. Inskip, and K. M. Godfrey was published in Clinical and Experimental Allergy in October 2016.